This is an all too familiar narrative for Todd Pletcher. He has won another three year stakes race and this time it was well off the beaten path. His three year old son of Tiznow, Royal Son, led throughout the race on his way to a smashing 5 and a quarter lengths victory in the ungraded John Battaglia Memorial Stakes at Turfway Park. This race may not be a traditional Kentucky Derby prep race, it is the primer for Turfway’s signature early season event for three year olds, the Spiral Stakes. The Spiral Stakes will take place on Saturday, March 21. Despite a Pletcher trainee going off at 9-1, the bigger surprise was The Great War finishing last in the field of 10 as the 1 to 5 favorite. The Equibase chart reported that he bled during the race, which may be why he faded so badly at the top of the stretch. Royal Son went straight for the lead upon the break from the starting gate with The Great War close in tow. Candy Charger was third, Midnight Trace was fourth, Milwaukee Mist was fifth, and Firespike was sixth within three lengths of the lead. Further back it was Pepper Roani in seventh, Task Force Glory in eight, Ekati Told Me in ninth, and Mini Cosmo was the trailer in tenth. There was little change in the running position of the horses throughout the first six furlongs. In addition, the fractions were not stressful with Royal Son leading the field through an opening quarter in 24.80, the half mile in 49.58, and the first six furlongs in 1:13.79 on polytrack. On the far turn it was clear that The Great War was not right as he started to tire badly while Royal Son opened up 3 lengths in the stretch. Pepper Roani made a solid run into second while Milwaukee Mist and Midnight Trace were one paced in the stretch to finish third and fourth respectively. Pepper Roani was second by 5 1/4 lengths, but it was another 12 3/4 lengths back to third. The remaining order of finish was Firespike, Task Force Glory, Candy Charger, Mini Cosmo, Ekati Told Me, and The Great War. Royal Son is trained by Todd Pletcher and was ridden by Rodney Prescott. He is a three year old son of Tiznow out of the A.P. Indy mare Mama Nadine. He paid $20.60, $9.40, and $8.60 as the third betting choice. Royal Son had the blinkers put on for the first time and it is easy to see the positive effect it had on his performance. It would be a big shock if Royal Son was not pointed towards the Spiral Stakes on March 21 for his next race since he was dominant in the John Battaglia on Saturday night. There are three races next weekend on the Road to the Kentucky Derby. The Grade 3 Gotham Stakes at Aqueduct, the Grade 2 San Felipe at Santa Anita, and the Grade Tampa Bay Derby at Tampa Bay Downs will be run with 50 points to the winner. Second, third, and fourth place finishers in each of those races will receive 20, 10, and 5 points respectively. Check back later this week to see previews for each of those races and recaps on Saturday night. There may not be any Road to the Kentucky Derby prep races this weekend, but there is one stakes race that could have an impact on the Derby prep races. That is the listed John Battaglia Memorial Stakes at Turfway Park. This is the final local prep before the Grade 3 Spiral Stakes on Saturday, March 21. The John Battaglia Memorial will feature a field of 10 three-year-olds going one mile and one sixteenth over the polytrack. The purse is $125,000 and is not part of the Road to the Kentucky Derby prep races. Post time for the John Battaglia Memorial Stakes is scheduled for 8:40 PM Eastern Time and is carded as the sixth race. Free past performances can be found here. 1. Mini Cosmo (15-1 Morning Line) – He debuted late in his 2 year old season at Laurel Park when he won by 2 1/4 lengths. After his debut win he went into a restricted race at Parx finishing fourth by a length and a half and then stretched out to a mile while winning an allowance race. His last two races have been in open stakes competition, but he has failed to make an impression with fifth and sixth place finishes. He will need to run much better than his previous two races to have a chance of even hitting the board. 2. 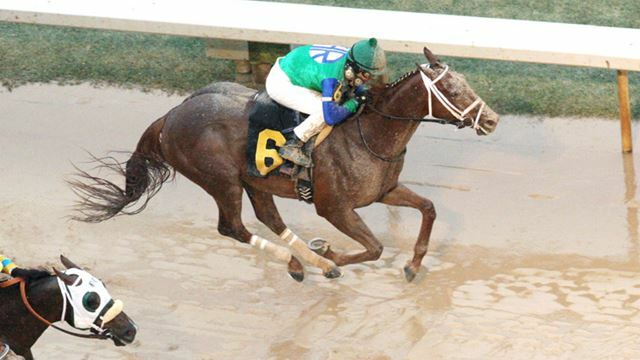 Candy Charger (30-1 ML) – He broke his maiden in his fourth start at Indiana Downs going a mile in the slop. He was shipped to Churchill Downs to face an allowance field where he was crushed by Dortmund, who has since become a top Kentucky Derby contender on the West Coast. His last effort was in the 96 Rock Stakes here at Turfway Park, but he was sixth beaten 15 lengths. He will like the stretch out back to two turns, but he will need to step up to contend here. 4. Task Force Glory (8-1 ML) – He has been run exclusively on turf in his first six starts. He broke his maiden in his fifth start after three second place finishes in the four previous starts. Last time out at Gulfstream Park on January 15, he was placed second via disqualification. There is little concern of him stepping on the polytrack for the first time give his ability to run on turf. The main concern is his string of 4 second place finishes in 6 starts. 5. 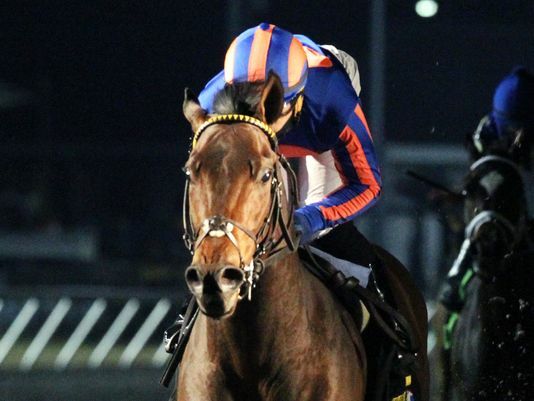 Ekati Told Me (50-1 ML) – He has two starts to his credit with one coming at Turfway Park last race. His debut was at Thistledown when he won by 2 1/4 lengths before facing stakes foes last time out. That was in the 96 Rock where he was crushed by The Great War while finishing 15 lengths back in fourth. He was sent off at 92-1 that day and he outran his odds. This will be his first start around 2 turns and could sneak into fourth place with some help. Pass on his chances to win the race. 6. Pepper Roani (12-1 ML) – This cleverly named son of Broken Vow was a maiden until his last start here at Turfway Park. He began on turf at Kentucky Downs (10th by 14 lengths) before transitioning to the main track at Churchill Downs (8th by 11 lengths). His third start was at Turfway where he began to improve going from fourth, to second, to third, to a win in the next four starts. There are concerns about his class, but the blinkers on last time really helped. Interesting horse at a price in this spot. 7. Milwaukee Mist (30-1 ML) – He broke his maiden going two turns here at Turfway Park in his debut. He beat the horse to his inside that day before cutting back in distance in the 96 Rock Stakes. Like every horse in that race, he was crushed by The Great War. He probably prefers a route of ground, but even that may not help him that much in this race. 8. Bordini (No ML) – Scratched from the field. 9. Firespike (4-1 ML) – He also began his career on turf with a second place finish at Ellis Park in July. He was then shipped to Saratoga where he finished third before breaking his maiden by a neck in his third career race. The Grade 1 Breeders’ Futurity at Keeneland on dirt ended with a 7th place finish (by 14 lengths) and he subsequently returned to the turf. 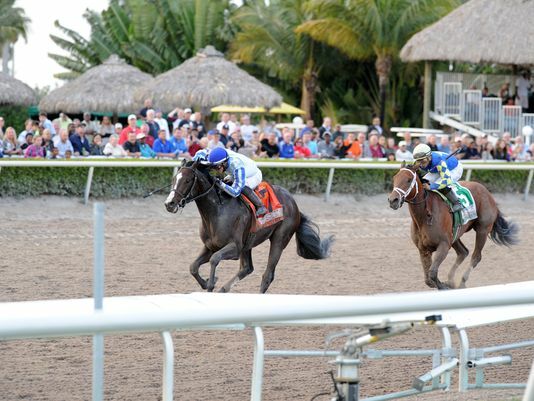 There he won his second race, a Florida bred stakes race before finishing 6th in open stakes competition. He recently won the OBS Championship at the Ocala Training Center over the synthetic surface. He rates a threat to the favorite, but will need to be on his A game to get in the victory photo. 10. Midnight Trace (8-1 ML) – Much like the horse to his inside, he began his career on turf. On December 27 he broke his maiden in his debut race at Tampa Bay by a length and a quarter. The next race was also on turf with a third place finish in a $75,000 optional claimer. There is not much worry about transitioning to the synthetic surface here and he should have a great trip off the leaders. 11. The Great War (1-1 ML) – We now reach the overwhelming favorite for this race. Like others in this race, he started his career on turf, but did so in Ireland. He won his first two career races before taking on Group 2 foes in the Norfolk Stakes at Ascot where he was fifth. His next four races were also in stakes competition, but he failed to win a race with his best placing in second. His final start in Europe resulted in his third victory before coming to the US for the Grade 1 Breeders Cup Juvenile on dirt. He finished 4th beaten 8 1/4 lengths before a freshening of 3 months. He returned to win the 96 Rock Stakes here at Turfway by 7 1/4 lengths. He can go gate-to-wire or rate right off the speed if necessary. He is squarely the one to beat here. This race runs through #11 The Great War and hit is hard to see him losing. With such a heavy favorite expected, the tendency is to look for value. #10 Midnight Trace could offer some value if the favorite falters at 8-1 on the morning line. The Graham Motion trainee should be in a great spot throughout the running. #9 Firespike offers little value, but has a big chance to hit the board as does #4 Task Force Glory. It is tough to completely ignore horses who consistently hit the board. #6 Pepper Roani is an interesting 12-1 shot that clearly improved last time out with blinkers on for the first time. For the biggest value #5 Ekati Told Me and #7 Milwaukee Mist could be used to add needed value to the ticket if The Great War does win. Remember to come back on Saturday night to see the recap of the 2015 John Battaglia Memorial Stakes. The sloppy track was not a problem for Far Right as he won his second straight stakes race at Oaklawn Park. Just as he did in the Smarty Jones, Far Right went to the far left on the rail to get up and win by three quarters of a length. The race started with Mr. Z intent on getting the lead from the far outside post. Pressing him throughout much of the race was Hillbilly Royalty with three lengths back to Kantune, Phenomenal Phoenix, and Bayerd. Behind that trio was Bold Animaux and Private Prospect while the trailing trio was Bold Conquest, Far Right, and Majestico nearly 10 lengths off the lead. Mr. Z and Hillbilly Royalty continued to duel for the lead through fractions of 23.61 for the opening quarter, 47.90 for the opening half mile, and 1:14.33 for the first six furlongs. The Truth Or Else made a strong, yet wide move on the far turn to get into contention and eventually took the lead by a head at the stretch call. To his inside were Mr. Z and Hillbilly Royalty, both of whom were still battling on. Not far of the three leaders was Far Right who ducked towards the rail to make his move. Bold Conquest was still in contention while the rest of the field was well out of it and had no chance of making an impact. It took nearly the length of the stretch, but Far Right was able to close in the slop to win with The Truth Or Else finishing second by a nose over Mr. Z. It was another three lengths to Bold Conquest in fourth and Hillbilly Royalty in fifth. The order of finish for the rest of the field was Majestico, Private Prospect, Bayerd, Phenomenal Phoenix, Kantune, and Bold Animaux. Far Right is by Notional out of the Vindication mare Zindi. He was ridden by Mike Smith and trained by Ron Moquett. He ran the one mile and one sixteenth in 1:47.50 over a sloppy track. Far Right paid $7.40 to win, $3.40 to place, and $2.80 to show. Unlike the Risen Star and Fountain Of Youth Stakes on Saturday, the Grade 3 Southwest Stakes distributed points of 10, 4, 2, and 1 to the top four finishers respectively. Far Right now has 22 points, The Truth Or Else has 6 points, Mr. Z now has 14 points, and Bold Conquest has 7 points. The points are used to determined who will make it into the Kentucky Derby starting gate. The Road to the Kentucky Derby has a break next weekend and returns on March 7 with three stakes races. The Gotham Stakes at Aqueduct, the San Felipe at Santa Anita, and the Tampa Bay Derby at Tampa Bay Downs will all be run on Saturday, March 7. All three of those races will be at one mile and one sixteenth with each offering 50 points to the winner, 20 points to the runner up, 10 points to the third place finisher, and 5 points to the fourth place finisher. The next Kentucky Derby prep race at Oaklawn Park is the Rebel Stakes on Saturday, March 14. The Rebel will also feature a 50-20-10-5 point distribution and be run at a mile and one sixteenth. International Star was taken to the rail by jockey Miguel Mena entering the stretch to save ground and it proved to be difference. In the process of winning the Grade 2 Risen Star, International Star proved he loves the Fair Grounds main track, but more importantly he stamped his ticket to the Kentucky Derby. The race began with St. Joe Bay going to the lead from his rail position with Hero of Humor pressing the pace as well. Tiznow R J was third by 2 lengths, Big Big Easy was fourth by three, and Bluff was in fifth about four and a half lengths off the lead. International Star was sixth, War Story in seventh, Imperia was in eighth, and Keen Ice was the trailer approximately 10 lengths behind the leader. The race shape remained unchanged until the far turn when the horses began to make their respective moves. International Star and War Story both began to move on the far turn with both horses first and second by the time they entered the stretch. International Star went up the rail inside of St. Joe Bay to take control. International Star would hold on to win by a length over War Story. Keen Ice used a strong burst to grab third over St. Joe Bay. The remaining order of finish was Imperia, Bluff, Tiznow R J, Big Big Easy, and Hero of Humor. The running time for the one mile and one sixteenth was 1:43.82. There was an objection claimed by Kent Desormeaux of War Story regarding the first turn, but it was disallowed by the stewards upon further review. International Star paid $9.60 to win, $4.60 to place, and $3.40 to show. He was ridden by Miguel Mena and trained by Mike Maker. He also earned 50 points for his victory, which gives him a total of 71 points and on top of the Kentucky Derby Points leaderboard. War Story earned 20 more points for finishing second, which gives him a total of 24 thus far and places him fifth overall. Keen Ice earned 10 points to give him 12 points total and St. Joe Bay earned 5 points for his fourth place finish to give him 6 points. The Road to the Kentucky Derby continues on Sunday at Oaklawn Park with the Southwest Stakes. The 2015 Fountain Of Youth was expected to be a good race and it certainly was. However, there was some controversy during the stretch run and the subsequent review by the stewards. In the end, the stewards determined Upstart, who finished first, impeded the finishing position of Itsaknockout, who finished second. Itsaknockout was placed first with Upstart being placed second by the stewards. The race began with Bluegrass Singer going straight to the lead with Frosted right off his flank by a half length. Itsaknockout was third, Juan and Bina was fourth, and Upstart was sixth. The trio at the back of the field were Gorgeous Bird, Frammento, and Danny Boy, who were both more than 5 lengths off the lead after a quarter of a mile. There was little change in the running order on the backstretch, but the race complexion changed on the far turn and in the stretch. On the far turn Frosted took the lead by a length over Bluegrass Singer with Upstart another a length and a half back. Itsaknockout was still 5 lengths back in fourth with Juan and Bina in fifth. Gorgeous Bird, Frammento, and Danny Boy were still the trailing trio. In the stretch, Frosted was still clinging to a half length lead, but Upstart and Itsaknockout were closing in. Upstart came out in the stretch and ran past Frosted with Itsaknockout right behind him. In deep stretch, Upstart drifted out to his right and took Itsaknockout with him. Frammento came from dead last, more than 15 lengths off the lead to grab third over Frosted. There was an objection and an inquiry into the stretch run and after several minutes, the stewards disqualified Upstart from first and placed him second behind Itsaknockout. The rest of the field was unaffected. The final order of finish was Itsaknockout, Upstart, Frammento, Frosted, Gorgeous Bird, Bluegrass Singer, Juan and Bina, and Danny Boy. The running time for the race was 1:46.28. Itsaknockout paid $12.80 to win, $5.00 to place, and $4.00 to show. He was ridden by Luis Saez and trained by Todd Pletcher. Itsaknockout is by Lemon Drop Kid out of the Cherokee Run mare Stormy B. For the win, Itsaknockout earned 50 points towards the Kentucky Derby Leaderboard, which puts him in second overall. Upstart earned 20 points for second place and now has 36 points total, good enough for third overall. Frammento earned 10 points, his first points in the Kentucky Derby prep races, and Frosted earned 5 points for a total of 13. The road to the Kentucky Derby continues on Sunday with the Southwest Stakes at Oaklawn Park. This post may seem very similar to another Southwest Stakes Preview and that is due to a rescheduling of the race. The Grade 3 Southwest Stakes was scheduled to be run on President’s Day, February 16, but an ice storm forced Oaklawn to cancel the card on Monday. Instead, the track decided to postpone the race until this weekend and will run the Southwest Stakes on Sunday, February 22. Surprisingly, there have been only a few horses who opted to go elsewhere for the weekend stakes races from the original field. In fact, 10 of the original 12 entrants in Monday’s race return for Sunday’s edition. Only War Story and J S Bach went elsewhere while Hillbilly Royalty threw his hat in for this race. This race will still feature points awarded to the top four finishers in the 10-4-2-1 allotment of Kentucky Derby Leaderboard Points. The 11 three-year olds will race a mile and a sixteenth on the main track for a purse of $300,000. The Southwest Stakes is carded as the eighth of 9 races on Sunday with a post time of 5:42 PM Eastern Time. Free past performances can be found here. 1. Bayerd (5-1 Morning Line) – After breaking his maiden by 11 lengths in his second start, he won 2 of his next 3 races in stakes competition before heading to the Smarty Jones Stakes last time out. He finished second in that race behind Far Right and after Mr. Z bore out in deep stretch. It was a solid race but he had every opportunity to draw off and win. His ceiling here is underneath. 2. Majestico (30-1 ML) – His first four starts were all on turf including the grade 3 Bourbon where he finished fourth despite being a maiden in that race. His fourth start on turf was his maiden breaker and he moved to dirt for his next two starts. He has not been competitive in those two starts and given the quality of this field, he will have another tough start here. 3. Hillbilly Royalty (7-2 ML) – He started his career at Remington Park on November 22 going a mile when he pulled clear in the stretch to win by 2 1/2 lengths. After a two and a month break, he resurfaced here at Oaklawn on February 6 in an optional claiming $62,500. He went gate-to-wire in that affair to win by 4 1/2 lengths going 1 1/16 miles. Now he comes into this race off those two wins and he should be able to control the pace from the slot (the rest of the speed horses are to his outside). He makes sense as a top pick here and is fortunate this race was postponed by 6 days. 4. Private Prospect (12-1 ML) – He finished fourth in the Smarty Jones Stakes by 2 3/4 lengths, but he was running evenly throughout much of the race. Prior to that he was 9th in the grade 1 Breeders’ Cup Juvenile and second in the grade 3 Arlington-Washington Futurity. He rates at an outsider here, but may hit the superfecta ticket. 5. Bold Conquest (10-1 ML) – He has run decently in all four of his starts beginning with his two maiden races at Saratoga. He was second by three lengths in his debut before winning his second start by a head. He finished second again in the grade 3 Iroquois at Churchill before a third place finish in the grade 1 Breeders’ Futurity. That start was more than four months ago and he may need this race. 6. Far Right (5-2 ML) – His last race was the Smarty Jones Stakes where he burst through on the rail to win by nearly 2 lengths. Prior to that he had back-to-back third place finishes in the grade 3 Delta Jackpot and the listed Street Sense Stakes. He had a solid pace to run at last time, but there does not appear to be as much speed. If he runs back to his last race, he will be close at the finish line. 7. Phenomenal Phoenix (30-1 ML) – He started his career at Remington Park with a third place finish before crushing his foes in his second start by 5 1/2 lengths. He stepped up into stakes competition in his third start and finished fourth by 6 lengths. Last time out, he was entered in an optional claiming $75,000 and finished second by a length. He is adding blinkers for this race, but he has to make a vast improvement to contend. 8. The Truth or Else (20-1 ML) – This son of Yes It’s True needed four starts to break his maiden and then went on to start in three straight grade 1 or 2 races. The first two resulted in third place finishes while the last one was a sixth place finish where he lost by 16 lengths. His latest race was on November 29 and he has been working well in the morning. The feeling here is that he will need this race. 9. Kantune (12-1 ML) – It has taken this guy a while to break his maiden, which he did last time out in his seventh start. To his credit, he has not run poorly in any of his 7 career starts with his worst finish being fourth by 3 lengths. He will be near the lead and if the pace is slow enough perhaps he can hang on for a piece. 10. Bold Animaux (30-1 ML) – He broke his maiden at Gulfstream Park West in October over the turf course before being crushed in the Juvenile Turf Stakes for Florida breds. He has raced 5 times in his career, all on turf with the last race in a $40,000 open claiming race. This is a very odd spot for him to try dirt and appears to be a deserved longshot. 11. Mr. Z (3-1 ML) – He is the most experienced runner in this field with 9 starts and the last 8 have come in stakes competition. The biggest concern for this runner is two-fold. First, he has 9 starts with only 1 win, but 4 seconds, and 2 thirds. The other concern is his last race when he veered out badly in deep stretch and finished third. He is certainly talented and classy, but his inability to win makes him a dangerous proposition at short odds. From a win perspective, this race comes down to #3 Hillbilly Royalty and #6 Far Right. The only other horse that could win here is #1 Bayerd while a stand is going to be taken against #11 Mr. Z after his bizarre stretch run in the Smarty Jones. #4 Private Prospect could hit the trifecta or superfecta ticket if things break his way. Do not forget to come back and read the recap of the Grade 3 Southwest Stakes on Sunday night and check out the future Kentucky Derby prep races here. The second of two Kentucky Derby Prep races on Saturday is the Grade 2 Risen Star at Fair Grounds Racecourse. The other Kentucky Derby prep race is the Grade 2 Fountain Of Youth at Gulfstream. 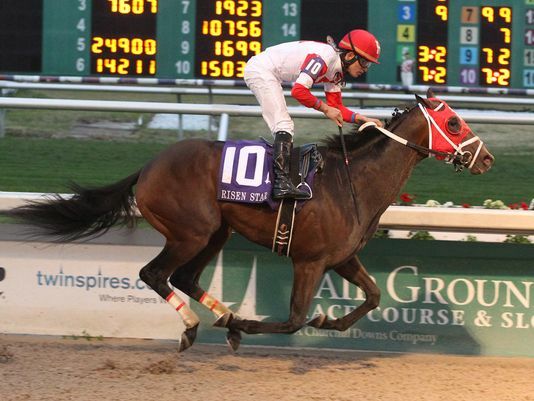 The Risen Star will be at 1 1/16 miles on the main track with a purse of $400,000. Like the Fountain Of Youth, this race carries a 50-20-10-5 point distribution to the top four horses towards the Kentucky Derby Leaderboard. The winner is virtually assured of a spot in the Kentucky Derby starting gate should they make it that far with a win in any 50 or 100 point race. 10 horses were entered for the Risen Star, but only 9 horses will start after the defection of J S Bach on Friday. Post time for the Risen Star is at 6:24 Eastern Time with free past performances here. 1. St. Joe Bay (12-1 Morning Line) – Two starts back, he ran in the Grade 3 Sham Stakes where he finished fourth by 9 lengths behind Calculator and Rock Shandy. His latest race was a second place finish in an optional claiming $80,000 when he tried to wire the field. He lost to impressive winner Prospect Park who is now under consideration for Kentucky Derby prep races. His early speed will help secure a good spot from the rail, but he may not hang around late in the stretch. 2. Tiznow R J (5-1 ML) – It took him three starts to break his maiden, but he did so with a 13 score going a mile and 70 yards at the Fair Grounds. His next race was the Grade 3 Lecomte on January 17 where he had great position throughout, but was unable to maintain his run in the stretch and finished third by 2 1/2 lengths. He should be able to sit off the pace here again, but the question is can he maintain his run in the stretch to win? 3. Bluff (12-1 ML) – He began his career against the horse to his inside and finished fifth by 18 lengths. In his second start he was eight by 7 1/4 lengths before breaking through in his third career race. He won by 5 3/4 lengths on January 22 geared down in the stretch. His two workouts since the win have been solid and he has a stalking style to stay in distance. However, he may be out of his class here against these horses. 4. J S Bach (5-1 ML) – Scratched due to a fever. 5. Imperia (7-2 ML) – He began his career on turf finishing second his debut before breaking his maiden in the Grade 3 Pilgrim at Belmont. His third start was in the Grade 1 Breeders’ Cup Juvenile Turf where he was 10th by 3 3/4 lengths. Four weeks later he made his debut on dirt and finished second by a head to El Kabeir in the Grade 2 Kentucky Jockey Club. He has not raced since then and the defection of J S Bach hurts the potential pace scenario. He still has a big chance to win this race. 6. War Story (5-1 ML) – He was originally entered to run in the Southwest Stakes on Monday, but the cancellation of the card at Oaklawn changed his plans to race here. He broke his maiden in his debut by 2 3/4 lengths before winning his second start by the same margin. His last race was the Grade 3 Lecomte when he was overtaken in the stretch by International Star and finished second by 2 1/2 lengths. He rates a big chance in this race. 7. Hero of Humor (30-1 ML) – He has 7 starts to his credit with a two wins and a second. Those finishes came in maiden or optional claiming events while his three starts in stakes competition have left a lot to be desired. His best finish of the three stakes starts was in the Grade 3 Lecomte on January 17 when he was sixth by 8 1/2 lengths. He will be on the lead, but expect him to fade in the stretch. 8. Keen Ice (8-1 ML) – He broke his maiden in his second start before trying stakes competition where he has yet to threaten in three tries. He was fifth in the Grade 1 Breeders’ Futurity at Keeneland by 13 lengths before finishing third by 8 1/2 lengths in the Grade 2 Remsen. His last start was in the Grade 2 Holy Bull where he finished a well beaten fifth by 10 lengths. He will have to improve drastically to make an impact here. 9. Big Big Easy (12-1 ML) – He broke his maiden in his second start by a neck at Indiana Downs and then tried stakes competition on turf where he finished ninth by 15 lengths. He returned to dirt to win by 3 1/4 lengths and went into another stakes race where he finished fifth by 15 lengths. This race is in New Orleans so a hunch play may be in order if you are so inclined. His chances to win are slime here. 10. International Star (9-2 ML) – The winner of the Grade 3 Lecomte found room in the stretch to win by 2 1/2 lengths over War Story and Tiznow R J. That win came from the rail and now he finds himself the widest horse in this race. He will have to find a nice spot from out here and he can certainly run late. He is another horse with a chance to win here. This race has a chalky appearance to it. #6 War Story should have a good trip behind the leaders while #5 Imperia will be coming late along with #10 International Star. #2 Tiznow R J has a chance to hit the ticket underneath while #1 St. Joe Bay and #3 Bluff could add value to the ticket. Check back on Saturday night for a recap of the Grade 2 Risen Star Stakes. The Grade 2 Fountain Of Youth Stakes at Gulfstream Park on Saturday is shaping up to be an excellent prelude to the Florida Derby five weeks from Saturday on the Road to the Kentucky Derby. The top four finishers from the Grade 2 Holy Bull Stakes return to run on Saturday as well as Itsaknockout who has been impressive in both of his starts. The Fountain Of Youth will be contested over the main track at 1 1/16 miles with the Grade 2 event carrying a $400,000 purse. A total of 8 horses will be competing in this race, but the most important aspect is the points that will be awarded to the top four finishers. The winner will get 50 points towards the Kentucky Derby Leaderboard, second place receives 20 points, third place receives 10 points, and fourth place receives 5 points. A win in this race essentially clinches a spot in the Kentucky Derby while a poor showing puts immense pressure on a horse to finish in the top two in their next start. Below is a look at each horse in the race. Post time is scheduled for 5:30 PM Eastern Time. Free past performances for this race can be found here. 1. Juan and Bina (20-1 Morning Line) – He ran fourth in the Holy Bull after attempting to come from off the pace. He was hard to handle for much of the race and had to go wide in the stretch. He now has the blinkers taken off in an attempt to settle him down. Prior to the Holy Bull, he was 5th in a listed stakes race here at Gulfstream and second in a listed stakes at Gulfstream Park West. Given the talent in this race, his ceiling appears to be underneath. 2. Bluegrass Singer (8-1 ML) – He also ran in the Holy Bull, finishing third after prompting the pace. His comment line says no match, which is a perfect way to describe his race. He won an optional claimer and a listed stakes race prior to the Holy Bull. In 8 starts he has only missed the board once (his debut). He will be a solid price, but the waters are a bit deeper this race and he is looking at an underneath finish. 3. Frammento (30-1 ML) – Yet another horse out of the Holy Bull, he was not a factor finishing sixth by 18 lengths. His only win has been at the maiden level (at Keeneland) with his next best race two back when he was second by 4 3/4 here at Gulfstream. That was against optional claiming $75,000 and his last race proved too tough of a test. Pass on his chances here. 4. Gorgeous Bird (6-1 ML) – Here is the first of three horses to not have run in the Holy Bull. He ran his debut race in August at Saratoga where he 6th in a 10 horse field. After a freshening, he came back 3 months later to win at Churchill Downs by a length and a quarter going 7 furlongs. Another break of 2 months gave him time to acclimate to the Florida weather. He came off that layoff to crush his foes by 7 lengths in an optional claiming $75,000. His bullet work on February 13 is a good sign and he could pull of the upset here. 5. Itsaknockout (4-1 ML) – We arrive at the lightly raced son of Lemon Drop Kid. His first start came here at Gulfstream on December 7 where he won a tightly contested race by a nose. He then came back on January 4 to crush an optional claiming $75,000 field by 5 1/4 lengths going one mile. It is hard not to like his chances here though he will have competition from the two horses to his outside. He is a must use on top in the exotics. 6. Frosted (5-2 ML) – The second place finisher in the Holy Bull, he tried to run down Upstart but was not nearly good enough. He has yet to miss the exacta in five career starts, however, he only has 1 win from those five starts. The Holy Bull represented his first start in nearly two months and he will have the blinkers put on for the Fountain Of Youth. He is a logical top three choice in this race to win. 7. Upstart (8-5 ML) – We have the class of the field in the 8-5 morning line favorite. He won the Grade 2 Holy Bull by 5 1/2 lengths after pulling away in the stretch. Before that race, he was third in the Grade 1 Breeders’ Cup Juvenile and second in Grade 1 Champagne. Jose Ortiz should have Upstart in a good spot all the way around the track and he will be the one to beat as they turn for home. 8. Danny Boy (15-1 ML) – Here we have a horse that has made 3 of his 4 career starts on turf. His broke his maiden in his debut at Ellis Park by 3 lengths before finishing fourth by 3 1/2 lengths in his only dirt race – the Grade 3 Iroquois at Churchill. He returned to the turf course for the next start where he was second by a half length in the Grade 3 Bourbon at Keeneland. He went on to the Grade 1 Breeders’ Cup Juvenile Turf where he had some trouble at the start and in the stretch. He finished 8th, beaten only 3 lengths, but has not raced since then. This is hardly the spot one wants to be in when making their second start on dirt. He will have a tough time against the horses here. Pass. After an extensive look at this race, it appears #7 Upstart and #5 Itsaknockout are the top two choices here. #6 Frosted is getting blinkers on and could be closer at the finish. #1 Juan and Bina, #2 Bluegrass Singer, and #4 Gorgeous Bird could all figure in the exotics as well. Check back on Saturday evening for a recap of the Grade 2 Fountain Of Youth Stakes.